The mid-block pedestrian crossing on Albany’s Santiam Highway. 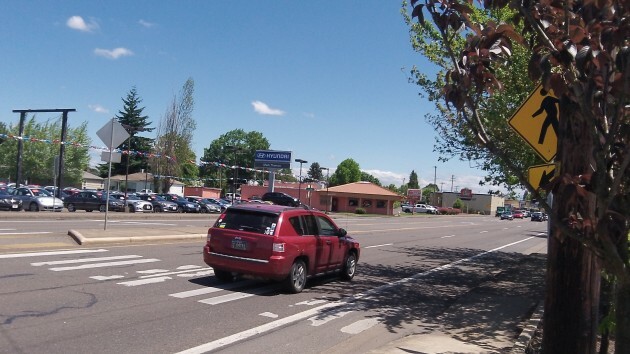 The gist of it is that from 8 till noon on Tuesday, people will attempt to cross Santiam Highway and Waverly Drive on two mid-block crosswalks. And the police will have officers ready to pull over motorists who fail to stop for the walkers. This will take place at the Waverly Drive crosswalk between Grand Prairie and 34th, and at the Santiam Highway crosswalk in the 2500 block in front of Fred Meyer. In the announcement of this operation, the police did not say whether they intend to ticket offending drivers, but the term “enforcement detail” suggests that they will. Participating officers will be paid overtime from a small ($1,470 ) federal highway safety grant, so officers will not be pulled off their regular crime-fighting or patrolling duties for this. The city says there have been problems at these locations — two children hit on Waverly and many close calls there and on Santiam. And it’s easy to see why. Both crosswalks are in the middle of the block where drivers don’t expect to encounter pedestrians. The crossings were put there to accommodate people who otherwise would have a bit of a hike to the nearest intersection. But still, it does not seem wise — at least to me — to put crosswalks in the middle of blocks on high-volume roads with lots of traffic signals, even in long blocks. It creates a false sense of safety for walkers. Maybe investing in flashing lights, such as Corvallis has on 9th Street and on Circle Drive for mid-block crossings, might be a wise choice? While those crosswalks are on a busy, 4 lane street, they do help a bit currently. That is, it is such a long walk to the nearest light, that folks will cross with or without the marked cross walk. It’s just understandable human nature, folks will not make make a quarter mile hike to cross a street. The current marked lines give motorists some signal, but perhaps we could do better. Whoever came up with the idea to put a cross walk in the middle of the block did not think this out first. It is a horrible idea. Even with flashing lights–which there are none on Santiam–there are issues. I watched a guy just miss being hit on 9th street in Corvallis, WITH the flashing lights. Besides drivers NOT expecting to see pedestrians crossing the street, twice I have been driving down Santiam on the curb side of the road when there is heavy traffic and large vehicles, or semis, in the 3 adjacent lanes, and it was IMPOSSIBLE to see through the traffic to see someone about to step into the crosswalk, on the opposite side of the street. The first time, I only stopped because the car beside me was stopping. I didn’t know why and couldn’t see. I never knew there was a crosswalk there, but the other car stopped so fast that I knew there was a reason. If someone gets killed or horribly maimed, the blood will be on the hands of those who decided to do this foolish thing. You can’t even see the signs denoting a crosswalk if traffic is blocking your view. Newcomers to town are at a distinct disadvantage; at least most of the locals now know they are there.